You must make bookings at least 5 minutes in advance of the time at Afternoon Tea at The Vanderbilt Hotel, Kensington. 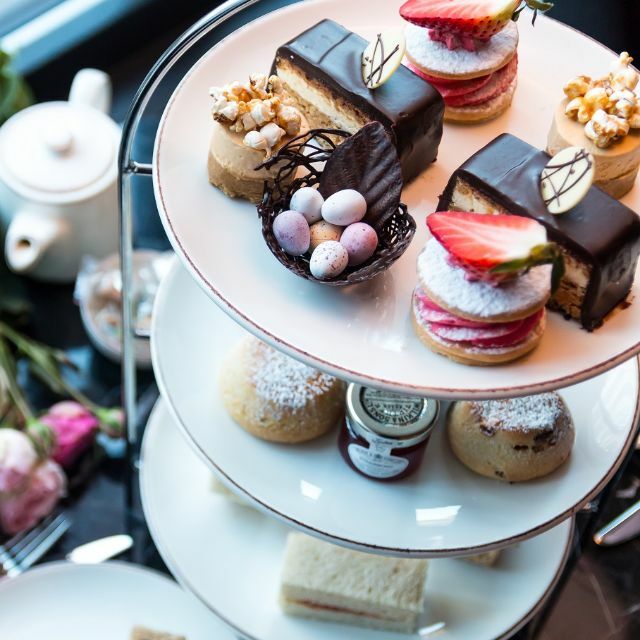 In honour of the annual Chelsea Flower Show and the summer ahead, Radisson Blu Edwardian Vanderbilt have created a remarkable, limited edition floral-infused afternoon tea. Delight in floral-enhanced macaroons and rose-iced cupcakes amongst other exquisite pastries in the heart of Kensington and Chelsea. Note this is the only afternoon tea served from Friday 18th May until Sunday 19th August 2018. Radisson Blu Edwardian Vanderbilt hotel in Kensington, is stunningly decorated with reclaimed furniture and fittings, intricately detailed high ceilings in keeping with the listed building, and elegant yet welcoming bay windows. At one with its neighbourhood, the restaurant design is created to encourage interaction and a sense of stylish comfort, with the addition of a private dining room, perfect for intimate events and family gatherings. The Afternoon Tea was lovely, 2 of us shared a nice bottle of prosecco and coffees with a tasty selection of sandwiches and pastries. Our kids chose chicken from the kids menu, which was oven baked and came with freshly cooked veg. The very helpful Sara even boxed up what we couldnt finish. Our waitress and the lady that seated us at our table was lovely. We felt really looked after and she ensured our table was in an area which accommodated two babies and pushchairs. I had a good time with a friend on my birthday there. However, there are several points to criticise about the afternoon tea we had: it took 45 minutes to arrive when we had a booking specifically for afternoon tea and other people had long been served already and it really wasn’t busy with new arrivals. The service was friendly and welcoming but seemed very busy and often it took a long time until we were noticed to get some more drinks. The scones were good, the sandwiches rated from not good and we didn’t eat it to very good. We only tried some of the cute looking pastries as felt quite full already at that time. It was very hot and noisy in the restaurant, the bar area however was too cold. Not possible to have a window opened in that area. They need some noise cancelling materials in that large room. It was fine for the day but wouldn’t go again nor recommend. a beautiful experience full of petals, flowers and delicious afternoon tea. rose petals were freshly prepared upon arrival - and promptly spread around our table. delicious gluten free option. well done and thank you! Fab! Went here in June- Afternoon for my mother’s birthday! Staff made it special indeed! The food was just fair. Good finger sandwiches but the pastries and assorted sweets were not very flavourful and rather dry. This is not inexpensive by any means, so we expected a higher standard. The table was net beautifully with rose petals and looked perfect. Service was good and friendly. I asked not to have meat and they made vegan sandwiches. The deserts were to big size, so we were not able to finish everything. Would recommend for those who like flowers. The staff were incredibly polite and extremely accommodating. My partner is lactose intolerant and the specially prepared a separate afternoon tea for him at no extra cost. They made us feel very appreciated and the food was lovely. The food was fresh and the scones were lovely and warm. Would definitely come here again, the atmosphere was lovely and ambient! This was booked as a Christmas present from my son and daughter in law. At £30 per person plus 12% service charge this was grossly overpriced!! The food was served un garnished and no choise given re bread preference. I refused to let my family waste their money on this and left without dining. An ok experience. We were the only people in the dining room, and despite that the service was a little slow. Each bottle of fizz which the waiter opened, he lost half a glass on the floor. Some of the sandwiches were a bit dry but cakes all good.